Dr. Filatova’s educational background and experience began when she obtained her degree in medicine from Vladivostok State Medical University in Vladivostok, Russia. She earned her Doctorate in Optometry from the New England College of Optometry in Boston, Massachusetts in 2011. After graduating from optometry college Dr. Filatova spent 5 years practicing in NM and AZ in the ophthalmology setting concentrating on primary eyecare, treatment and management of ocular diseases such as glaucoma, macular degeneration, viral and bacterial infections of the eye in both adult and pediatric patients. 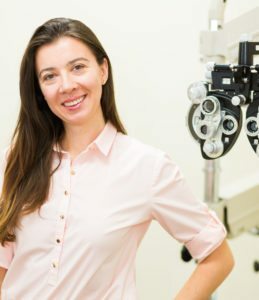 Dr. Filatova is experienced in pre- and postoperative care for cataract and laser procedures, evaluation and comanagement of refractive surgery patients (LASIK & ICL). She enjoys fitting contact lenses and working with kids. Dr. Filatova strives to deliver the highest quality of eyecare possible. She believes that everyone needs healthy eyes and clear vision. She takes pride in the accuracy and efficiency of the diagnosis and treatment that takes place within our clinic. As a native of Russia, Dr. Filatova is fluent in the Russian language. She resides in Gilbert and is active in the local community. In her free time, Dr. Filatova spends time outdoors and enjoys traveling, hiking and fishing. Theresa has been with Golden Hill Optical for over thirteen years. Theresa’s passion for her work shows through the years of experience in the field. 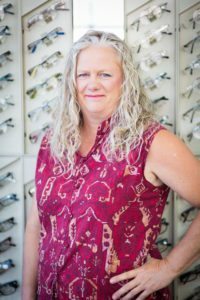 Before joining Golden Hills Optical Theresa spent over twenty years in the lab cutting and edging lenses and adjusting frames to ensure proper fit and maximum comfort for the patient. She works hard to ensure smooth operation of the optical and accuracy of handling glasses orders. In her free time she enjoys spending time with her family. What day and time would you like us to call you to schedule your appointment?